Alan Stubbs today insisted he won’t let comparisons with Scotland captain Scott Brown turn the head of Hibs kid Scott Martin. The 18-year-old has caught the imagination of the Easter Road support, his high-energy performances against Rangers and Montrose, in which he scored his first goal, leading some to make comparisons to Brown as he began to make an impact in the green and white of Hibs at a similar age. 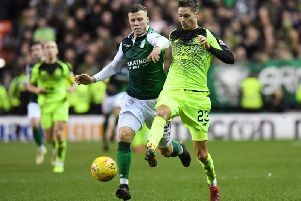 But while admitting it was “high praise” for Martin for his displays to remind some of the young Brown, Stubbs believes he won’t have any trouble in keeping the youngster’s feet firmly on the ground. The head coach said: “We have a really good opinion of how Scott can do. He has played the last two competitive games and I think he has done really well. Has he surprised me? Probably the answer to that is ‘no’, but he has probably surprised me more the way in which he has taken it in his stride. “He’s just turned 18 and he is going the right way, that’s the most important thing. The fact he is with the squad at that age tells you what we think of him and from that point of view he is doing remarkably well at this moment. “But obviously we will have to keep his feet firmly on the ground. He has a lot of attributes. To me he is a throwback to an old midfield player; he’s very tenacious, he’s aggressive and likes a tackle, he works his socks off, gets through a lot of metres and covers a lot of distance on the pitch. And as far as the comparisons to a teenage Brown are concerned, Stubbs said: “It’s high praise but we will certainly be putting no expectations on Scott. I think when you have had top players at a club there’s always the temptation to liken them to certain players. Meanwhile, Stubbs was happy to have been handed another home match in the second round of the League Cup, Hibs having been drawn against Stranraer. He said: “It’s a good draw. We are happy that we have been given another home tie and an opportunity to play in front of our own supporters.